Welcome to this month’s Universal Heart Newsletter. Some of you may know that I spend a few minutes reflecting or praying before I post on my public Facebook page most mornings, and when I was posting earlier today I found myself writing the phrase, “Beauty of spirit is contagious”, and felt again the truth of that. When we are in the presence of someone who is compassionate, who respects and loves life, and who is capable of generosity and joy, we feel so much better. And of course the vital unfolding choice throughout our lifetime is not only to be in the presence of such people, but to be such people. This is surely a lesson sometimes learned in the hardest, harshest moments when all the familiar strategies are no longer enough. That’s such a familiar theme in my work, I know! And maybe particularly in Forgiveness and Other Acts of Love and The Universal Heart. But the older I get the more comfortable I am knowing that some themes will need refreshing and re-thinking on a fairly continuous loop until the very end. This is not because it takes us a while to learn the simplest and most profound lessons (though it does!). It’s also because we learn things differently and often more powerfully when the circumstances of our lives change…as they constantly will. My wish is that you would let yourself know – let yourself consciously identify – what supports you in hard times, and also what lets you celebrate and appreciate life when it’s easier for you and those you love. Please don’t waste a moment re-living or bemoaning the petty inconveniences; focus on what’s going well or on what you need, now, today, in terms of spiritual strengths and resources. I so hope that some of the talks, books, posts, letters like these, serve to support you in this? Writing them has changed my life for the better. Not made it “easy” or detached (that was never my goal), but far calmer, more robustly appreciative, and far safer inwardly. No small thing. For those of you who can’t get to Sydney, it is still possible to enjoy part of the services, thanks to Brad Harris’ faithful uploading of the talks onto “Interfaith in Sydney” on YouTube. Here’s the link http://www.youtube.com/user/interfaithinsydney You will also find some retreat talks there (with more to come). 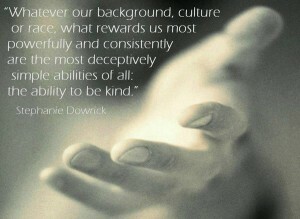 For more support please also visit my website or “Official Stephanie Dowrick” Facebook page. Your thoughtfulness in using and in sharing these resources makes all efforts so worthwhile. I’m also hoping that you are visiting the Universal Heart Book Club? This is a terrific way to “talk” with you about books and ideas that can enhance, intrigue, inform… We now have more than 80 articles up, with new ones added through each month. There are video discussion between Walter Mason and me; also written reviews from us and from other very fine writers including Jane Goodall who is hosting a lovely new feature called “Reading Life”. You can share comments, opinions…requests. That’s what makes it a “club”: that you can engage as much as you would like with us and other readers. 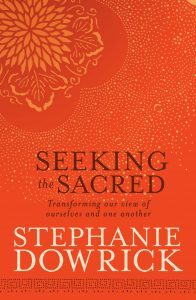 You can also directly support this Network by buying virtually any book – not only the “recommended” ones – through the “Stephanie Dowrick Bookstore” which is a far from glamorous website but is reliably run by Collins/Seek. All books are discounted and each book sold returns a small % which is our sole support for this Network. As always, I send heartfelt thanks to those of you who are choosing this way of buying your books. I realise that you have many more alluring sites to choose from so my appreciation is enormous. Collins/Seek are not interested in updating their “look” for small people like me; they simply rely on good service. Once the books arrive, I hope you will be very happy!! Also, it’s the only place where you can currently buy any of my three GUIDED MEDITATION CDs. These are all now in limited supply as Vision Australia have ceased to produce them. 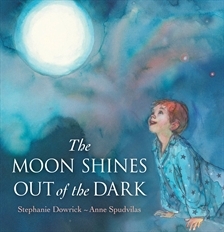 I’ve also added a link below – on the image – to The Moon Shines Out of the Dark, my children’s picture book so beautifully illustrated by Anne Spudvilas. Finally – but not least – a reminder of several forthcoming retreats or public events. I am again teaching a writing course at New South Wales Writers Centre in Sydney, this time on 27 July as a one-day workshop. And of course I am teaching writing and creativity more generally during the annual “Writing in Kyoto” Retreat, 24 October – 2 November. This is a glorious trip for writers and would-be writers at all levels. For details please go to THIS LINK. A very special reminder, too, that I will be teaching again at Mana Retreat Centre, Coromandel, New Zealand, from 3-6, 6-9 October. The three additional days are for those who want extra time, rest and reflection. I will be there (teaching, supporting) for the entire time. For me it will be such a treat to have a longer experience of beautiful retreat life. Please enquire now – and if you are travelling from Australia or elsewhere to NZ, it’s still possible to get a very reasonable fare. Shuttles or ferry available from Auckland. Mana can help organise that. 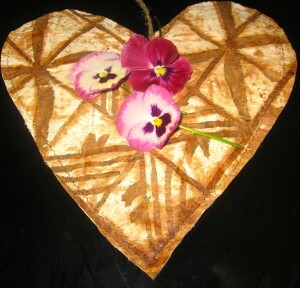 Retreat details and booking at their website: web address is http://www.manaretreat.com Telephone: (NZ) 07 866 8972. Details follow in full for Sunday’s interfaith service. Please take a quiet moment to think who might benefit from your sharing of any part of this email. A celebration of seven years of spiritually inclusive services. These services may meet your needs for a time of peace and renewal. We offer readings and reflections from different traditions, shared prayers and brief meditations, an inspirational talk and always sublimely beautiful music. Please send this information to anyone who may benefit. 3rd Sunday of each month, 3pm. Pitt Street Uniting Church, 264 Pitt Street, Sydney 2000. Nearest cross Street is Park. Some street parking available. Excellent public transport to Town Hall. We ask you to arrive a little before 3pm if possible. We must start promptly. The service is about 75 minutes with tea and coffee afterwards for those who can stay. You can also join the community singing with Sydney Sings director Elizabeth Lecoanet at 1.15-2.15pm (before the service). A lovely treat and no charge is made.